Pictured are: Will Giffen, Adam Ploeger, Wyatt Phipps, Zachary Hamdan, Xander Simpson, Jack Taylor, William Bruce & Andrew Meister. The Cincinnati United Monroe Lightning U8 Boys select soccer team started the spring soccer season off with a bang by taking home the Championship in two tournaments. 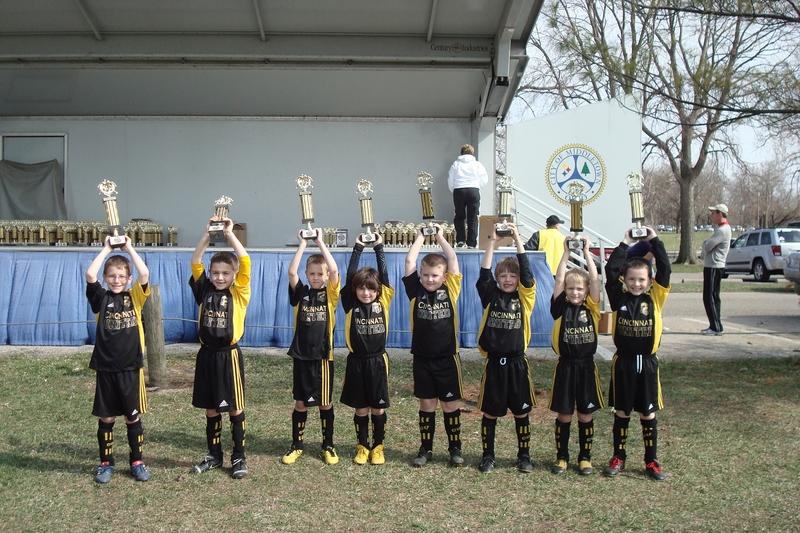 The Lightning won the Middletown Spring Blast held March 19-20 by posting a 2 win -1 loss record in the preliminary round and avenging their loss with a 3-1 finals victory over BSA Celtic White U8 Boys. The Lightning continued their success by winning the Mid-American Soccer Classic held in Fairfield, Ohio April 9-10. The boys endured the heat, rain and mud to post a 2-0 record in the abbreviated preliminary round and came from behind in the second half to bring home the title with a 3-2 victory in the finals over TFA Elite U8 Boys. The team is coached by Emad Hamdan and Mike Simpson.